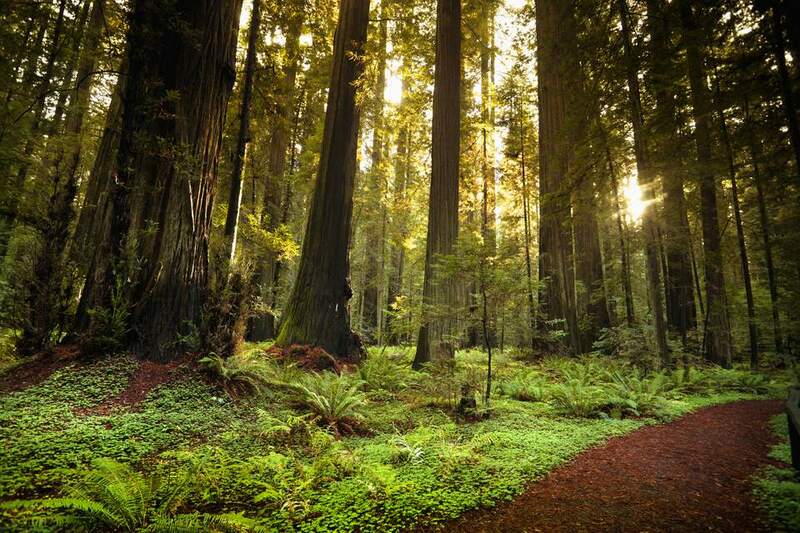 For the neck-bending height of its trees, no redwood park in the State of California can beat Humboldt Redwoods. The park is also impressive for its size, almost twice as large as the city of San Francisco. One-third of Humboldt Redwoods is an old-growth forest, the largest expanse of ancient redwood trees left on planet earth. The densest and most impressive stands of Sequoia sempervirens grow in the park along Bull Creek and the Eel River. Humboldt Redwoods is also one of the best places in California to see the redwoods by car. If all you do is drive through the park on the 32-mile-long Avenue of the Giants, you will be glad you did as you cruise between trees as tall as 15-story buildings. Avenue of the Giants: The 32-mile-long drive is the most accessible and impressive thing to do at Humboldt Redwoods. Find out all about it in the Avenue of the Giants guide. Founders Grove: If you only stop to see one grove of those massive trees, visit Founder's Grove. It's a place to take an easy walk through a forest that was once home to the Dyerville Giant, a tree that was larger than the Statue of Liberty. The giant is gone now, but you can see standing trees and fallen ones and get up close to them all. Women's Federation Grove: One of many redwood groves in the park, the Women's Federation Grove features a four-chimneyed hearthstone designed by Hearst Castle architect Julia Morgan. It's also a nice place for a walk or picnic near the river. Eel River: The river running through the park provides places for fishing, boating, and swimming. During the fall and winter, you can fish for salmon and steelhead trout on a catch-and-release basis only. Anyone who fishes and is 16 years old or older must carry a valid California fishing license. Horseback Riding: Local companies offer guided riding treks, including Redwood Creek Buckarettes and Redwood Trails Horse Rides. Hiking: The park has more than 100 miles of trails for hikers and bicyclists. Check Redwood Hikes for a summary of them. If you want to go camping among the redwood trees, Humboldt Redwoods is a far more pleasant place to do that than Yosemite National Park. It has more space between its sites and is less crowded year round. Lots of online reviewers comment about how clean the campgrounds are at Humboldt Redwoods and one reviewer called them "almost god-like." The park has three campgrounds with 250 campsites. They can accommodate trailers, campers, motorhomes to 24 feet long. None of them have hookups and you will have to carry water to your campsite from nearby spigots. See where they are located on the campsite map. Burlington Campground is near the visitor center and is the only campground open in the winter. It's in a second-growth forest, with huge tree stumps scattered around, which some people find dismal but others think are fascinating. The sites are flat and can accommodate trailers. Hidden Springs near the town of Myers Flat is the park's largest campground. Part of it is in an old-growth redwood forest, with sites that are shady and far enough apart that you won't get to know every little bit of your neighbors' business. Albee Creek is west of U.S. Highway 101. It's the smallest and nicest campground in the park, at the western edge of Bull Creek Flats. The westernmost campsites at Albee Creek are in an open meadow and the rest are beneath second-growth redwoods. The park has a healthy population of black bears. Most of them stay in the backcountry and are not dangerous to people. Storing your food properly is essential to keep things that way. Find out how to stay bear safe in a California campground. The park is open year-round, but the visitor center closes on major holidays. Summer high temperatures are usually 70°F to 90°F, with lows in the 50s and morning fog that burns off by noon. Winter highs range from 50°F to 60°F, with lows in the 20s to 30s. The park also gets 60 to 80 inches of rain per year, most of it between October and May. Snow is unusual and mostly falls above 2,000 feet elevation. In late summer, keep an eye out for algae warnings on the river. When the water is low, blue-green algae blooms can be hazardous to humans and animals. Poison oak grows in the park and can cause severe rashes for some people, who give it nicknames like "itchy rash vine" or other unprintable descriptions. Its leaves grow in groups of three and are never side by side. Find out more about what it looks like. The endangered marbled murrelet bird (which is related to the puffin) nests in the park. You can help it survive by keeping your campsite super clean, not feeding the wildlife and being careful not to drop food while you're hiking. The reason for all the cleanliness: Food scraps attract ravens, crows and Stellar’s jays, which will find and eat marbled murrelet chicks and eggs. Your cell phone may not get a signal in much of the park and even in the nearby small towns. Your phone's GPS may give you a route while you have access, but you won't be able to re-route when you lose it. To navigate without interruption, go old school and take along a paper map. Two marathon races happen in Humboldt Redwoods, which can close the park's main road for up to six hours. They happen in early May and early October. For dates and details, check the Avenue of the Giants Marathon website or see the Humboldt Redwoods Marathon site. For more information about the park, visit the Humboldt Redwoods State Park website. The Humboldt Redwoods are part of the scenic drive called the redwood highway. Humboldt Redwoods is between Garberville and Eureka just off U.S. Highway 101. You can enter from any of several exits along the highway.